It is not uncommon that assessment centers or seminars result in 1.000 or even more observer assessments that have to be entered and evaluated. Often, the time pressure to complete this data collection is very high as the results need to be discussed promptly. 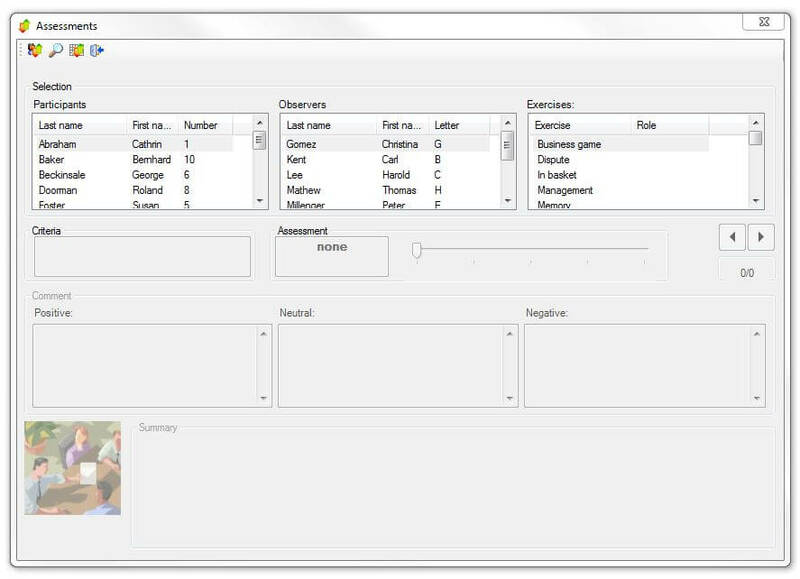 The order in which the evaluations of participants and observers or exercises are entered can be defined by the user. Tedious sorting through assessment sheets is therefore no longer necessary. 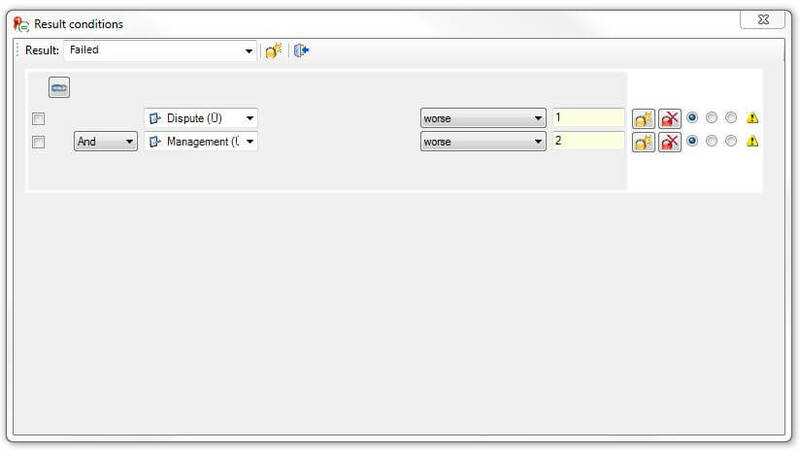 At this point of the process, the user is already able to see a participant’s summary as well as a summary of still missing data in the dialog window. 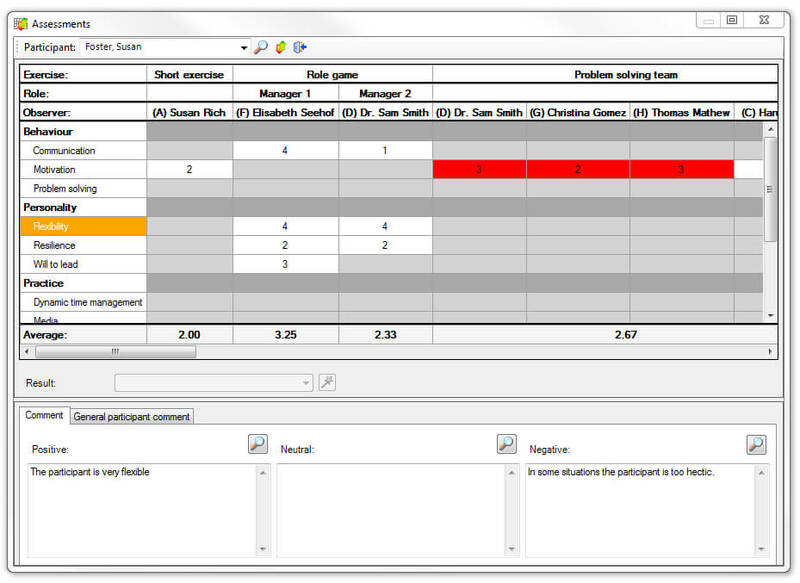 Thanks to this feature, individual assessments that might have been forgotten or overseen earlier can be easily added. Ingentis easy.pes enables you to save values and positive, negative or neutral comments as part of an assessment matrix. The comments can either apply to the overall seminar or to a certain criterion or exercise. Later on, these comments can be added to the participant’s report as text module. In addition, it is possible to highlight a criterion’s values in terms of color to point out if there’s a great discrepancy between the observers assessments. At what point has the participant successfully passed the event? Ingentis easy.pes allows you to define specifications for the results after the assessments have been captured. As a result, the user is able to precisely determine how the seminar result is to be classified, e.g. at what point the participant has successfully passed the seminar or assessment center. These conditions can be defined for individual criteria, competencies and exercises, or for the overall result. Multiple conditions can be associated with one another if desired. Would you like to see for yourself how easy.pes works? Get in touch with us for a free trial version. Do you have any questions regarding Ingentis easy.pes? Are you interested in a consultation? Don’t hesitate to contact us via the contact form below, we look forward to you hearing from you.